Run your way to health! Anyone can run. Really. I'm going to say that one more time so you know I mean business; ANYONE can run. 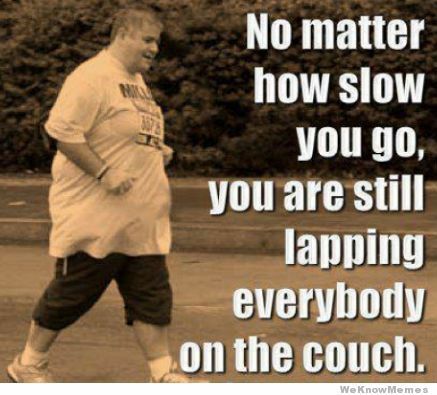 Not everyone can be a marathon runner, and not everyone can run a 6 minute mile, but you can find a pace that works for you and enjoy it. You can also enjoy the healthy benefits of running as an added bonus! Here is an excellent link from www.RunnersWorld.com where they break down how to find your own "running recipe". The best part about running is you can do it anywhere and it's FREE! The only expense you'll have to pay for is a good pair of running shoes. If you can find someplace that will give you a free consultation to see how your feet strike (Second Sole in Ohio is a great resource. If you're not in Ohio, you can contact them and ask them what stores might be able to help you in your area), where you need the most support, and what kind of shoes you'll benefit from, you'll only be investing $100-$140 for a decent pair of shoes that should last you for 200-300 miles. I often hear that "I can't run because I have bad knees". Although this may be true for a small group of people, it's not true for most. What is true is that bad form/technique can cause further issues with your knees when you run. But if you take the time to look into your form, how you strike, and shifting your weight, anyone with bad knees can run. You'll just need to run on a softer surface (like a track), wear good shoes, and stretch. Strength training is also important. If you decide you really enjoy running and you're looking to commit more of your time to enjoying the sport, make sure to keep your back, core, and legs strong. That just means working out 2-4 days a week. Investing the time to workout and run means you're investing in a healthier, longer, better quality life.